Yeah, so… Hurricane Superstorm Sandy blew through the region as promised, and left horrible damage in its wake, as feared. Connecticut got off relatively easy — at least compared to New York City and New Jersey. This week’s story is unusual in that it does not feature our usual intrepid little band of survivors, instead focusing in on lost sheep Andrea and her new pal, the katana-wielding Michonne. But that doesn’t make this a bad episode; in fact, it’s a very important chapter. 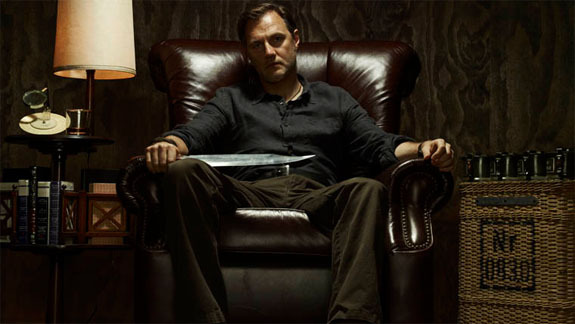 Merle is reintroduced (with a blade replacing his severed hand), the town of Woodbury is introduced, and we get to meet the man in charge – and the season’s Big Bad – the Governor. The Guv is a very popular character from the comic book series. I tip my hat to The-Powers-That-Be for making an exposition-heavy episode so entertaining. This is one of those stories where characters are moved into place and conflicts are set up for future episodes, but the story still worked for me. And I’ve been wondering what was happening with Andrea and Michonne since they left their safe haven. I don’t know how long I will have before Hurricane Sandy puts out the lights around here, so I’m going to post an entry that’s a bit different. I’ve put together a sort of photo essay that shows what conditions were like before the storm hit the area. I will have a more standard entry — a review of the latest episode of THE WALKING DEAD — tomorrow. Attention, everyone: The Ricktatorship is in full effect! Rick is totally in charge, and if you don’t like it, there’s the door. Mind the walkers, tho. The episode picked up directly from last week’s amazing ending: With our friends trying to keep Hershel (Scott Wilson) from bleeding out after Rick (Andrew Lincoln) chopped off his leg. Meanwhile, the surviving band of prisoner looked on in confusion at these interlopers, who didn’t even seem to care about them; they were all focused on Hershel. Once he was stabilized, Rick met with the prisoners, who had trouble accepting that civilization had fallen. Tomas (Nick Gomez) and Axel (Lew Temple) wanted Rick’s band to leave their cellblock, but Rick wouldn’t hear of it, pointing out that they spilled blood to capture the place. 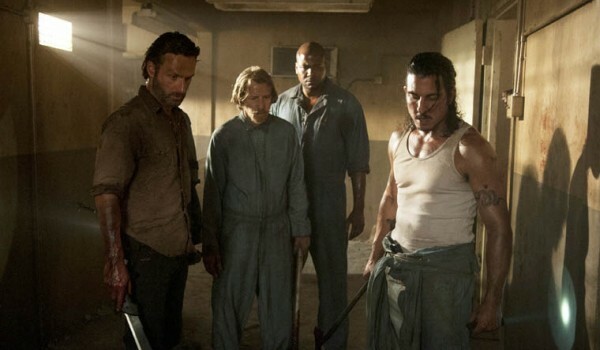 But a bargain was reached: In exchange for food and medicine, Rick would help the prisoners clear another cellblock. By its seventh season, most shows are running out of ideas, so you often see radical changes — like adding a kid or changing the format or bringing in a lot of new supporting characters, and the show is never really the same. DEXTER is in its seventh season, and the producers have changed the format in a big way — but without ruining the show. 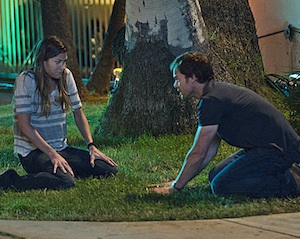 In fact, the series has been revitalized, and I am impressed by how good DEXTER has been this season. Last season’s umbrella story of the Doomsday Killers was interesting, but I think it stumbled in the execution; there wasn’t quite enough meat to the story of the aspiring serial killer played by Colin Hanks and his mentor, played by Edward James Olmos. (Perhaps casting two such well-known faces also got in the way of suspending our disbelief. But then again, it worked with John Lithgow in season four. It feels like the-powers-that-be at AMERICAN HORROR STORY ASYLUM have a lot of story to get through and are wasting no time getting there; this week’s episode gave us origin stories for Sister Jude and Shelley the Nymphomaniac, not to mention confirming my suspicions that Dr. Arden is precisely the twisted, self-loathing creep he appeared to be last week. And, not only is Zachary Quinto thrust into the story this week, his character is sketched in fairly quickly as the voice of “modern” medicine at the asylum. Last week we learned that aliens exist in the AHSA universe, and this week shows us that the supernatural is real, as well. One does not often see those two elements mixed. I am interested to see if the “superscience” and supernatural will work together. Conan – the Real Conan the Barbarian – Will Be Back! Stop the presses! He’ll be back! Arnold Schwarzeneggerwill be playing Conan the Barbarian once again – yes, at his age! The man who may be most famous for saying, “I’ll be back,” is coming all the way back – back to the film that made his bones in Hollywood. It was confirmed today that Schwarzenegger will play the title character in The Legend of Conan, a film for Universal that looks at the warrior king later in life. The story will ignore Arnold’s previous sequel, 1984’s Conan the Destroyer (as well as Jason Momoa’s unrelated 2011 Conan the Barbarian) in order to follow up on the 1982 original, Conan the Barbarian. I’m actually rather excited about this news, because tales of King Conan are among my favorites from pulp author Robert E. Howard’s oeuvre. But I wouldn’t bring in his son, Prince Conn (short for Conan), for this movie. I think Schwarzenegger the man needs more distance from his real-world trouble with kids before playing a father onscreen.